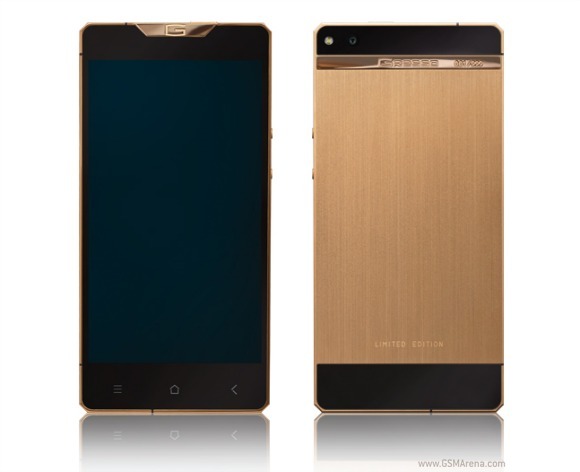 Well known luxury smartphone maker Gresso has added a new device to its Regal series. It's called Gresso Regal Gold, and, like most of this company's offerings, it's going to be a limited edition. Only 999 units will be made, each one coming with an 18K yellow gold insert onto which that phone's individual number will be engraved. You can choose which number you want, by the way. The Regal Gold is styled to look like a bar of gold, so that it never looks outdated. The case is made from golden PVD-coated titanium, a technique often used by Swiss luxury watchmakers because it increases resistance to scratches. The case is actually produced from a grade 5 solid titanium plate, which is widely used in the aerospace industry. The machining and milling process takes 8 hours to create each 8.8mm thin Gresso Regal Gold. Its back panel comes with directional polishing, which takes an additional 3 hours to manually perform. Each handset is made by a single craftsman. Of course, the Regal Gold is also a smartphone. It runs Android, though it's unclear which exact version. It boasts a 5-inch 1080p touchscreen with Gorilla Glass, a 13 MP rear camera with LED flash, a 5 MP selfie snapper, 2GB of RAM, and 32GB of storage. It's powered by an unnamed 1.5 GHz quad-core processor, has 3G support but no 4G, and should last for a maximum of 6 hours talk time and 300 hours standby time. If you're interested in picking one up, Gresso will gladly help you out, so long as you agree to part with no less than $6,000 in return. Oh, and at this price you even get free worldwide shipping.